The travelbug mission is to provide elegant travel organization solutions for you and your family. 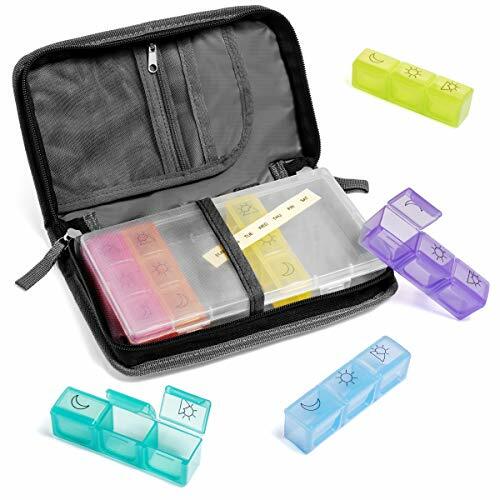 Our travel pill organizer and premium carrying case allow you to store a week's worth of medication and supplements for your life on-the-go. Eliminate confusion with the rainbow colored daily pill cases and days of the week label so you never have to worry again. CONVENIENT TRAVEL SIZE fits perfectly within any travel bag or carry on (9.5 in x 6 in x 2 in). The seven colorful daily pill boxes allow for added flexibility to take with you as you travel around for the day. LEAVE BEHIND ALL YOUR PILL BOTTLES: Each of the large individual 21 compartments holds up to 5 fish oil capsules. Pill box designed with seven bright colors and comes with days of the week labels to mark each day of the week to avoid mixing up the days. STRUGGLE-FREE LIDS are made of high quality and durable BPA FREE plastic that will stay closed when needed to prevent pills from spilling. If you have any questions about this product by travelbug, contact us by completing and submitting the form below. If you are looking for a specif part number, please include it with your message.